New York State has a strong industry growing winter and summer squash with over 4,000 acres produced in 2014 with a value of over 31 million dollars. There are many different types of winter squash that are grown including hubbard, buttercup and spaghetti, but butternut and acorn types are the two dominant ones for production. 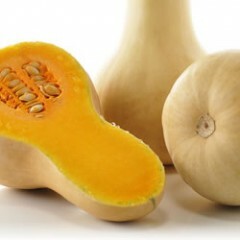 Winter squash is also sold for wholesale and fresh market use. There is also a significant amount of butternut squash that is cut and peeled and repacked and sold through grocery stores. Powdery and Downy Mildew, and Phytopthroa blight are the major diseases we are concerned with.